My favorite Associations Now author, Ernie Smith, wrote a great article in today’s issue about building community around your most engaged users. Amen–my favorite topic! Kudos to the Boston Globe for recognizing that creating a community for its most engaged readers is a great tactic. But a Facebook Group as the home for that community? Now I’m crying. 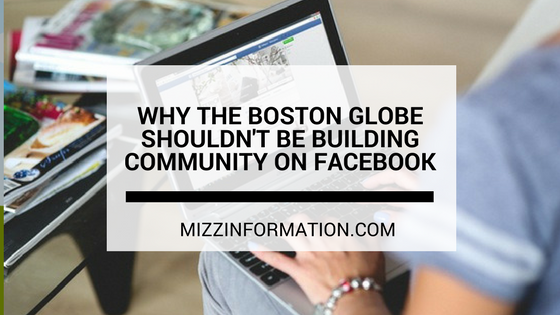 Even Ernie agrees with me here that by hosting the community on Facebook, the Globe is ceding ownership to Facebook–something others may not think is a big deal. I mean, it’s Facebook, the biggest social network on the planet–what’s not to like? When it comes to community building, there’s actually plenty not to like about Facebook–or any free, third-party social networking site. This is where the concepts of social media and online community diverge, in my opinion. Facebook pages drive traffic and can drive engagement on Facebook, which is hopefully tied back, in some way, to a larger strategy that goes beyond vanity metrics. But online communities? Facebook, LinkedIn, Google+, other public social networks’ “community” features? Are horrible places to invest in building a community, IMO. I’ve written about this before in the context of LinkedIn (and apologies in advance if some links in that post are broken–I’m in the process of a major housekeeping/link fixing project here on Mizz Info but it’s nowhere near done yet), and the same holds true for Facebook or any other “free” platform. From the user’s perspective, sure, we’re already on Facebook, or LinkedIn, so navigating to the group can be easy enough in the course of a given day–the equivalent of stopping and having a conversation in the line at Starbucks or at a happy hour with a group of people. But in terms of the enduring value of an online community–being able to come back and refer to the group’s collective knowledge–have you ever tried that in a Facebook or LinkedIn group? Good luck with that. My hero in life, Rachel Happe, wrote about this in an HBR article in terms of the “networked value of answers”–The geometric value of making an answer available to the entire community forever (i.e. cost avoidance, productivity and opportunity identification) and Ben Martin elaborated on it in the context of associations. The group functionality currently offered by Facebook, LinkedIn, Google+ (communities) just doesn’t compute when it comes to this important facet of online community’s enduring value. Then there’s the value to the business–in this case, the Globe. It’s no secret that journalism is broken–in particular, the newspaper industry. Digital subscriptions aren’t generating the revenue that traditional ads did, and the demands of a 24/7/365 news cycle and the race to be first and also to hire not only trained journalists but also have them be able to produce video, graphics, broadcast live from their iPhones on the spot, Tweet, and all the rest of what goes along with reporting news in this day and age–oh, and there’s no money to pay them because of the aforementioned decline in revenue…obviously revenue generation is paramount. Sure, audience engagement for the sake of engagement is fine…but the bottom line is that it doesn’t pay the bills, as evidenced by layoffs too numerous to list here…but Daily Dot, Medium…just Google it and you’ll get the picture. So why, then, would the Globe not house this community of its best hope, its most engaged readers and subscribers, on its own turf rather than send them to Facebook, which is already vying to become the ultimate news source? A private community platform would allow the Globe to tie the group to its CRM, automating the process of ensuring group members were paying subscribers. It would enable them to track and record engagement in their own terms, not Facebook’s….oh, wait, Facebook doesn’t offer any metrics for groups! It would enable them to monetize the platform with ads and sponsorships and video that isn’t interrupted by ads. It would enable them to control the platform and archive discussions, rather than being at Facebook’s mercy should they decide to eliminate groups when they no longer serve a purpose for Facebook. And yes, I’m still bitter about Facebook removing the discussion feature like five years ago. Anyway, I’ll digress. 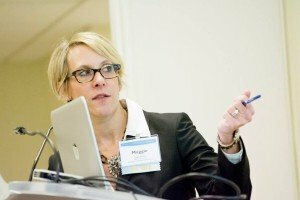 But I’ll end with this thought–if businesses–including associations–are moving more and more towards being data-driven, and at the same time are starting to recognize the value of online communities, obviously being able to track meaningful metrics for an online community is hugely important, right? So any platform that’s free, is out to serve its own bottom line and interests, AND doesn’t offer any metrics for its community feature–let alone let you tie it back to your own CRM–is not the place to invest in building community. As a funnel back to your owned community? Sure, why not. But as the solution to engagement or revenue problems? Just no. By the way…speaking of online communities, Community Manager Appreciation Day is only a few weeks away. I’m excited to be part of the team hosting this year’s festivities. Check out the schedule of events we have planned and sign up (it’s free!) to tune into the day-long webcast.